Last Spring Colby Jones woke up one morning and decided to paint a mural on his fence. When you travel east on Walnut Hill Ln. 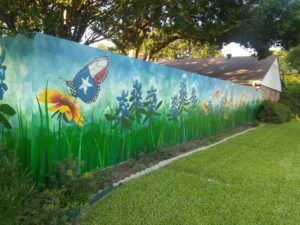 in Lake Highlands, a block west of Plano Rd., a splashy, colorful, breath-of-nature mural on a fence to your left will probably captivate your attention. Be careful driving. The depictions of a field of bluebonnets, butterflies painted like the Texas flag and stately sunflowers was created by 1963 Bryan Adams H.S. (BA) alum Colby Jones, and it’s only one of many Jones’ art pieces around town. After studying art at the University of Texas and earning a BA in art and history from Texas Lutheran University, Jones got sidetracked with a little part-time job for Dallas Parks and Recreation Department (Parks and Rec). Thirty years later he retired, after spending the past 20 of those at the Lake Highlands North/Skyline Recreation Center. “I accomplished career goals, and then returned to my true love of art,” he said. Jones has incorporated that passion into his other allegiances, including family, faith, community, journalism, sports and humor. 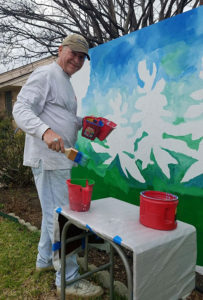 He has illustrated brochures published by the United States Soccer Federation and has been published in The Dallas Morning News, The White Rocker, The Seguin Gazette, The Daily Texan, The Lone Star Lutheran and The Pitch. While with Parks and Rec, Jones enjoyed watching three-generations of Lake Highlands families grow up. He said, “I saw 5-year-olds grow into 30-year-olds and bring their own children there,” he said. One of his earliest memories of drawing seems to be close to his heart. “I’ve been drawing for as long as I remember. As a child I would draw my older sister’s paper dolls and outfits. While some of the 74-year-old’s contemporaries are watching Fox or MSNBC from their recliner, fishing, golfing or playing poker, Jones can be found being a soccer referee, painting a mural, coaching kids’ soccer, riding his bike at White Rock Lake, singing in the Central Lutheran Church choir and everything else that takes energy. Jones has received various awards from the National Arts Program and a blue ribbon from the State Fair of Texas. According to the artist: “Both of my parents appreciated art and encouraged us. My dad, my son and I (three generations) were all published in the Daily Texan at UT. At BA art teacher Barbara Maples got me a scholarship at the Dallas Museum of Fine Arts for two years under Chapman Kelly. Jones will be the first to tell you that family is the most treasured and most accomplished part of his life. His beloved wife of 40 years, Beverly, passed away Mother’s Day 2008. Their daughter, Keri Carpenter flies for Southwest Airlines and is based in Phoenix. Kyle, their son, lives in Houston where he works in production for a Japanese company making live-action and Anime films. The grandfather likes to brag about his four grandchildren: Sam (14), P.J. (13), Jaclyn and Lilly (both 11). His siblings are also BA alumni. His sister Charlotte was in the class of 1960; Norma graduated in 1961; his sister Wanda graduated in 1973; and his brother Mike was a 1974 graduate. The East Dallas-bred Jones said he loved growing up in White Rock, where his family enjoyed drives around the lake. “At Reinhardt Elementary School I loved playing sports for Mr. Gerber and Coach Hill. We beat one of Clark Willingham’s teams for the championship,” he said proudly. He was not fond of playing for Coach Neal at Gaston Jr. High, a sentiment he shared with many of his teammates, but did enjoy drawing cartoons for the Gaston Signal. He was also proud of his dad for writing for The White Rocker. While at BA, he got interested in journalism. He wrote articles and drew cartoons for the Cougar Chronicle, and covered BA games for The White Rocker. Jones was the editor-in-chief of the BA Senior Pub. “My friends and I spent a lot of time cruising Charco’s,” he recalled with a big grin. He added that he made a lot of life-long friends in high school and still gets together with many. When we spoke with Jones on a Monday, he was on his way to have a cold beer with old cronies who meet weekly at Ozona on Greenville Ave. Fellow BA alumni Clark Willingham and DeLyne Garten are just a couple of those who usually show up. “Last week we had a crowd because I was buying the first round,” he quipped.